In a wonderful surprise after years of haggling, 24 countries and the EU created the largest marine preserve in the world – protecting most of Antarctica’s Ross Sea. Antarctica is surrounded by the only oceans that remain relatively untouched by human activity. 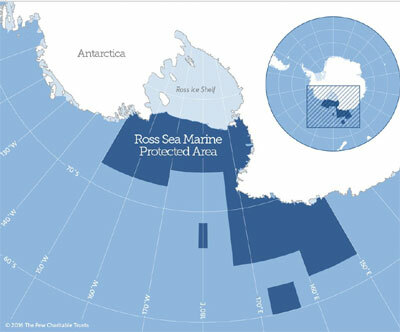 At 598,000 square miles (2-3 times the size of Texas) the Ross Sea Marine Preserve provides vital habitat for 10,000 species including whales, penguins, Weddell seals, colossal squid, seabirds and krill – which sustains life in all the world’s oceans. In a compromise with Russia and China – which have fishing interests there, and Japan – which refuses to give up whaling – protection is granted for 35 years, followed by a review. All extractive activities are banned – fishing, mining and removing any wildlife. Only research will be allowed in certain areas. Russia and China will still be able to fish, just far away from breeding and feeding grounds. Sadly, at the International Whaling Conference, also taking place this week, Japan prevented a “yes” vote for creating a whale sanctuary in the South Atlantic, where most whales are killed. “The world is finally beginning to understand the urgency of the threats facing our planet,” says Secretary of State John Kerry. “This happened after many years of persistent scientific and policy review, intense negotiations, and principled diplomacy, he says. “Today’s agreement is a turning point for the protection of Antarctica and the Southern Ocean. This is important not just for the incredible diversity of life that it will protect, but also for the contribution it makes to building resilience of the world’s ocean in the face of climate change,” says Chris Johnson, ocean science manager with World Wildlife Fund/ Australia. The decision came at the annual Commission for the Conservation of Antarctic Marine Living Resources, the international body responsible for stewardship of Antarctic waters. Perhaps most important is that this is the first marine preserve in international waters, setting a precedent for protecting marine areas beyond individual countries’ boundaries. While the US and other countries have begun to preserve significant marine areas, most of the ocean is in international hands. Only 3% of the world’s oceans are protected. At this summer’s World Conservation Congress, President Remengesau of Palau – which has preserved its entire ocean area – lobbied for a goal of protecting 30% of the world’s oceans … and it passed. In his 32nd book, “Half Earth: Our Planet’s Fight for Life,” published this year, E.O. Wilson says we could save 80-90% of species if we set aside about half the earth’s land and sea. “Large parts of nature are still intact – the Amazon region, the Congo Basin, New Guinea. There are also patches of the industrialized world where nature could be restored and strung together to create corridors for wildlife. In the oceans, we need to stop fishing in the open sea and let life there recover. 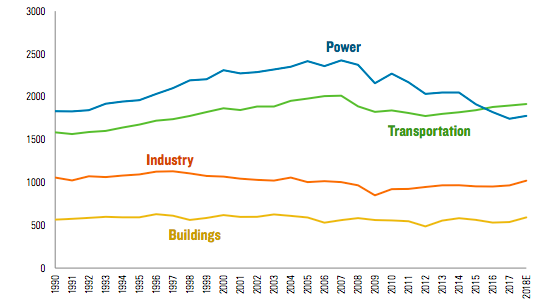 The open sea is fished down to 2% of what it once was. If we halted those fisheries, marine life would increase rapidly,” Wilson explains. Oceans have absorbed 93% of the world’s carbon emissions, “curbing the heat felt on land but drastically altering the rhythm of life in the ocean,” says Dan Laffoley, at the International Union for Conservation of Nature. He’s among 80 scientists who produced “Explaining Ocean Warming,” the most comprehensive study on the subject to date. If this heat from carbon emissions had gone into the atmosphere instead of the oceans, average temperatures would be an inconceivable 36°C higher, rather than the 1.3°C we are experiencing now, scientists explain. Marine life of all kinds are moving to cooler areas, “1.5 to five times as fast as anything we are seeing on the ground, the report says, and disease is spreading in plant and animal populations … which will also effect humans. The building blocks of sea life – phytoplankton, zooplankton and krill – are changing dramatically, with scary repercussions for the entire food chain. 550 species of fish and invertebrates are already listed as threatened. Global ocean surface temperatures are the warmest since records began. This is killing the world’s coral reefs, eliminating habitat for much of the world’s marine life. Meanwhile, Antarctica is melting much faster than scientists anticipated.